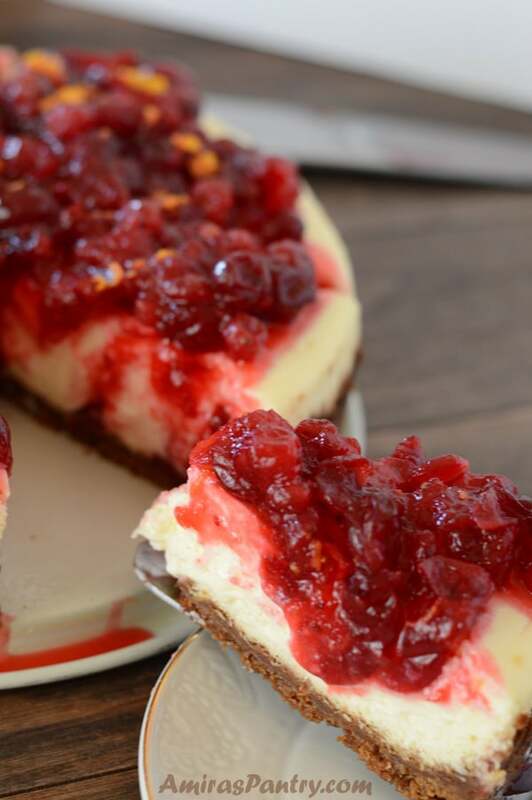 This Cranberry Orange Cheesecake recipe with gingersnap crust is the showstopping dessert you’ve been looking for – just in time for the holidays!. Made even lighter with low-fat cream cheese and sour cream with a foolproof trick… from now on making a cheesecake will be a breeze. 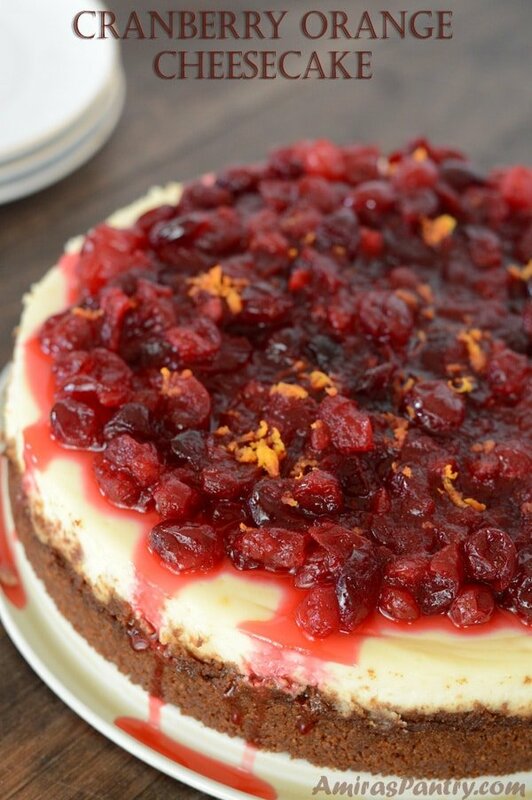 A holiday dessert with cranberry orange cheesecake, this classic cheesecake owes its distinctive deliciousness to the sweet and tangy orange flavored cream cheese mix along with a luscious cranberry sauce with a hint of bitterness. Creamy decadence – every bite is pure bliss! 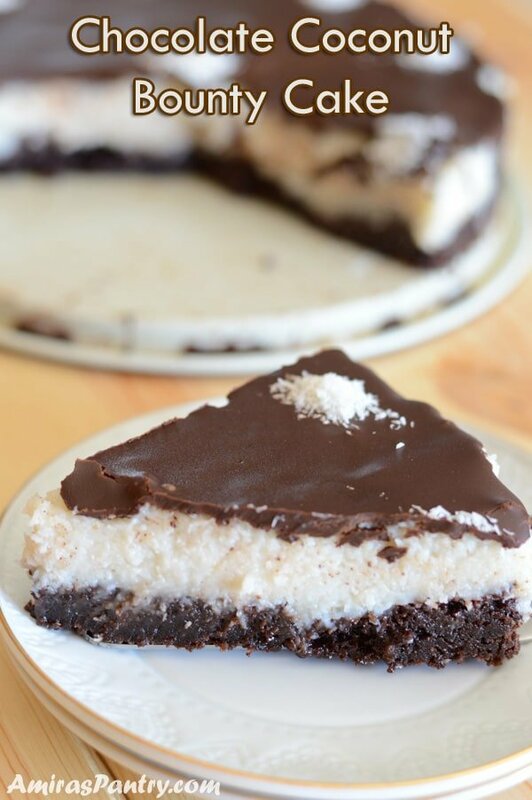 Making my own cheesecake has always been a culinary adventure that I did not dare to take. So much work – or so I imagined- and what’s with the water bath thing?!! and making sure that water does not seep through!! seems a lot of hassle and made me freak out and prefered to stay away. Until we had a gathering this Thanksgiving and I was responsible of the desserts menu, it is one of the biggest events for us as we all gather and make it a festive blessful night for all of us, especially the kids. 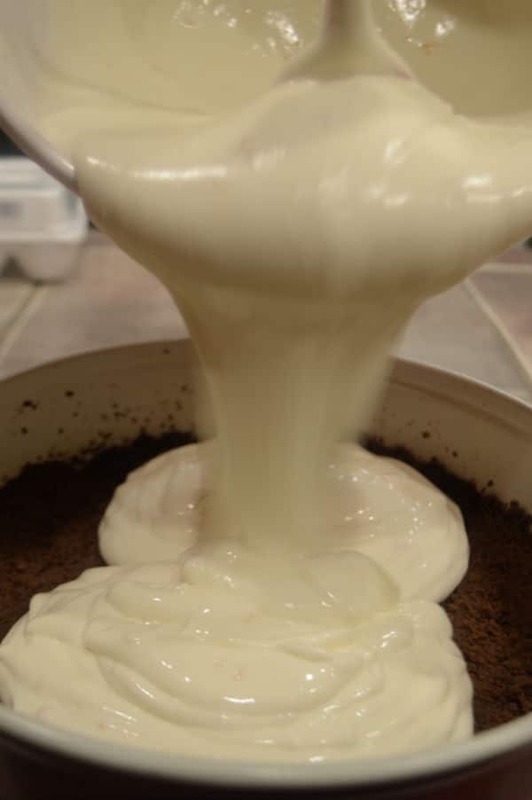 So I wanted to make something special and decided to try this cake as a wow factor but I sure had a backup plan which did not save me in the last minute, when disaster struck and I am going to explain this soon, get ready . First, I’ve used gingersnap cookies, which I think is a very good idea if you want more spiciness in your crust, and let me tell you it was very appreciated and welcomed by all. Second: I made the filling lighter using fat free cream cheese and sour cream, next time I might even use yogurt in place of the sour cream. And now for the trick guys, I just put my pan in an empty oven bag… that’s it, no wrapping in double heavy duty foil, no freaking out that the water might get to the cake… just put your pan in a wide enough oven bag and place it in another wider pan with an inch or so of water. Let it bake in the oven, mine was done after exactly 55 minutes, opened the oven door ajar for 10 minutes then closed the oven door and let it set there for another hour. 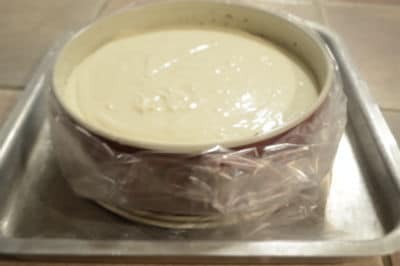 Then take it out and leave it on the countertop for yet another hour or so until completely cool to room temperature, off to the fridge overnight and in the morning you will have a velvety, creamy and perfect cheesecake, no cracks no grains no faults. 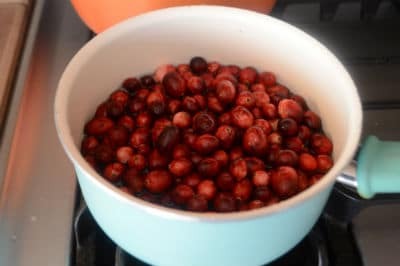 Perfect and festive, ready to be topped with whatever you like and in my case here a vibrant delicious cranberry sauce. I know it takes a lot of time but first, it is idle time meaning you are just waiting for it either in the oven or to cool down or in the fridge, second: it is worth it, beleive me. For my utmost sadness and shock and horror , this cake did not make it to the desserts table, why?, well when I was getting it out of the fridge, it slipped out of my hands and went straight to the kitchen floor , I was really about to cry. I went through the three stages denial, rejection and finally acceptance :). I kept looking at it spread out on the floor -with almost only a 1/3 of it still on the platter- with an increasing sense of guilt, it was my fault. Really a two day work went to the floor! !, thank God that I managed to take photos. Of course I had backup plans but this was incase something went wrong while making it and I had only 30 minutes. I had other stuff I’ve made but this was my masterpiece. So anyways I headed to the store and bought another fancy cheesecake, but was not as good as mine and not as fancy and made with love as mine. I wanted to take a photo of the cake on the floor, but then I did not wish to break your hearts as well . But what about the third that was left? you ask, it was licked to the last crumb. 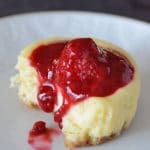 Tall, decadent and tastes like no other store bought cheesecake, really the homemade one is totally better in every bite. 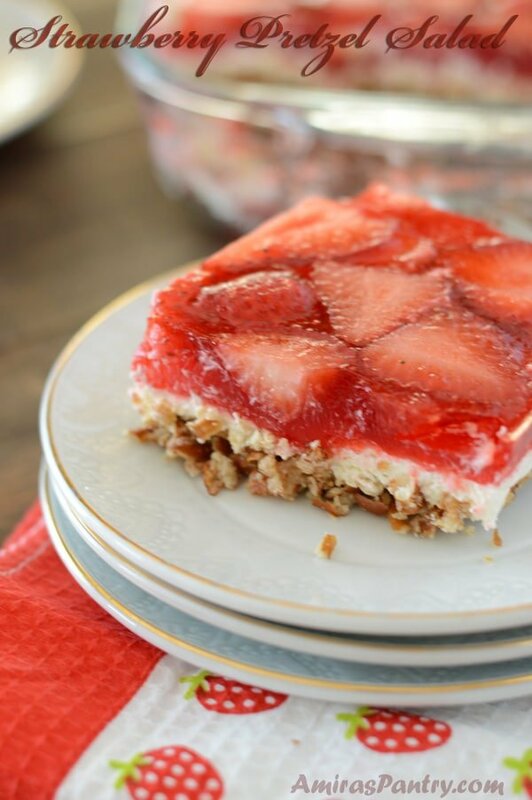 Make your holidays bright and festive with this cheesecake recipe. 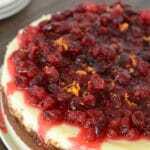 I hope you’ll like this foolproof orange cranberry cheesecake recipe and until next recipe … have a blissed holidays. 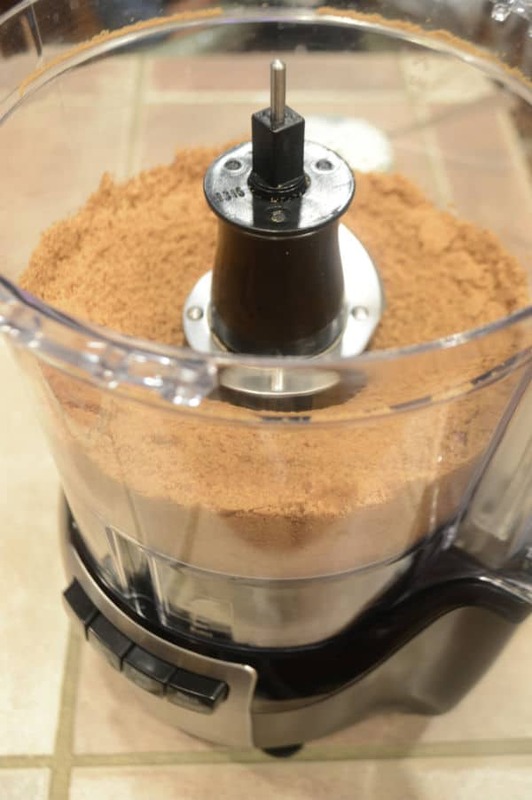 A dash of vanilla powder you can use 1 teaspoon vanilla extract. In a food processor, pulse the cookies until finely ground, add melted butter and salt, pulse two to three more times until everything is very well combined. Press firmly into the bottom and sides of a 9inch springform pan. Bake for 10 minutes. let it cool down while you prepare the filling. Reduce the heat to 330F. 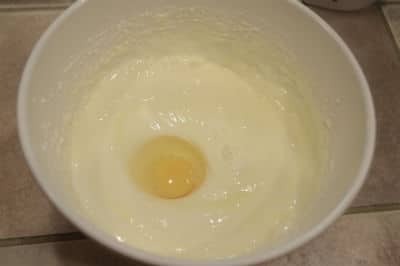 Add eggs one at time, blending well. Add vanilla and sour cream. Cover the pan from the bottom and up to the sides with an oven bag***. Place the pan in a larger pan. 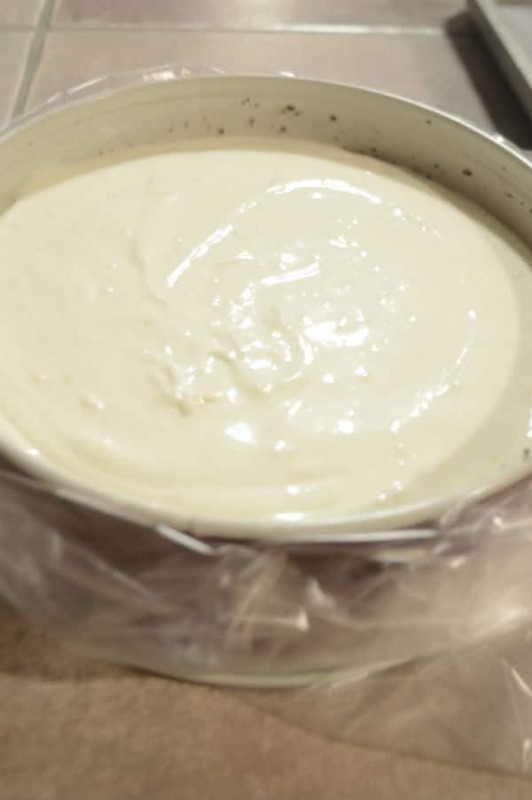 Pour the cream cheese mixture into the base you’ve already made. Pour water in the larger pan until it is up by about 1 inch. Place the two pans in the oven and bake for 50-55 minutes. Turn off the heat and open the door ajar for 10 minutes. Close the oven door and let it set there for another hour. Take it out on the counter to cool for almost another hour. Place water and sugar in a saucepan over medium heat and bring to a boil. Add cranberries and continue cooking until all cranberries are popped, takes about 10 minutes. Right before serving, use a slotted spoon to scoop the cranberries on top of the cake. Slice with a hot knife to get cleaner cuts, wiping in between cuts. 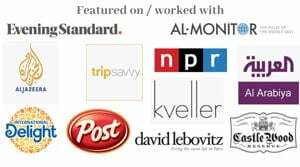 * If you forgot to take it out of the fridge you can place the cream cheese- with its foil cover sealed completely- in a bowl with hot water to soften them. 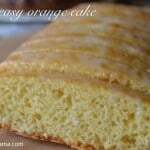 ** Use less orange zest if you - or your guests- are not an orange enthusiast. *** I’ve used the 8lb bags. Need something to sweeten your days? 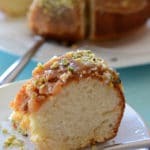 Visit our ever growing desserts recipes. 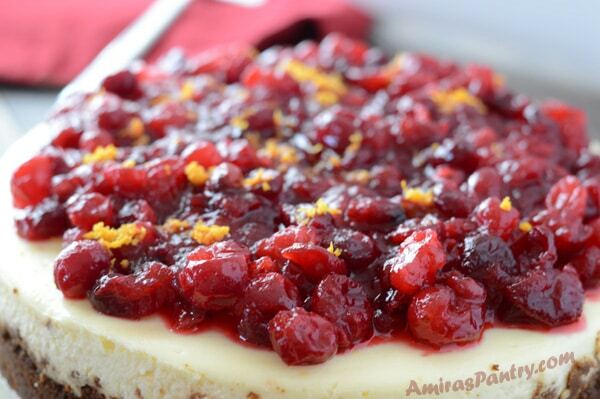 I’ll need to try it Amira – cheesecakes are my favorites! It must have been so hard to see your lovely cake on the kitchen floor.